Cyprus issued its first modern coins in its own name in 1879 under the British. These were minor coins only, piastres and half piastres, there being 9 piastres to the shilling, and twenty shillings to the pound. This system continued until 1955 when Cyprus decimalised its currency, the main change being to introduce the mil, with 50 mils equal to one shilling, and therefore 1,000 mils per pound. 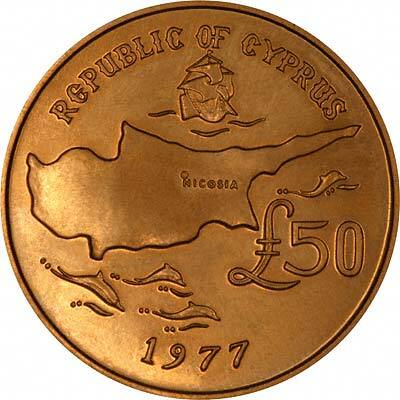 After Cyprus gained its independence as The Republic of Cyprus in 1960, it issued its own coins with new designs, and eliminating the shilling denominations. 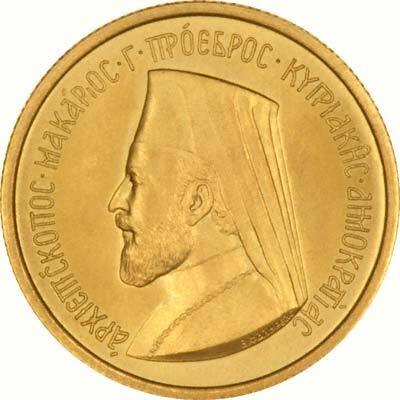 The first gold coins of Cyprus were issued in 1966, but are generally considered to be medallic issues. These are denominated as sovereigns, halves and five pounds. A former British colony, Cyprus became independent in 1960 following years of resistance to British rule. Tensions between the Greek Cypriot majority and Turkish Cypriot minority came to a head in December 1963, when violence broke out in the capital of Nicosia. Despite the deployment of UN peacekeepers in 1964, sporadic intercommunal violence continued forcing most Turkish Cypriots into enclaves throughout the island. In 1974, a Greek Government-sponsored attempt to seize control of Cyprus was met by military intervention from Turkey, which soon controlled more than a third of the island. In 1983, the Turkish-held area declared itself the "Turkish Republic of Northern Cyprus," but it is recognised only by Turkey. The latest two-year round of UN-brokered talks - between the leaders of the Greek Cypriot and Turkish Cypriot communities to reach an agreement to reunite the divided island - ended when the Greek Cypriots rejected the UN settlement plan in an April 2004 referendum. The entire island entered the EU on 1 May 2004, although the EU acquis - the body of common rights and obligations - applies only to the areas under direct Republic of Cyprus control, and is suspended in the areas administered by Turkish Cypriots. However, individual Turkish Cypriots able to document their eligibility for Republic of Cyprus citizenship legally enjoy the same rights accorded to other citizens of European Union states. Nicosia continues to oppose EU efforts to establish direct trade and economic links to Northern Cyprus as a way of encouraging the Turkish Cypriot community to continue to support reunification. We show a photograph of the 1966 sovereign and half sovereign. 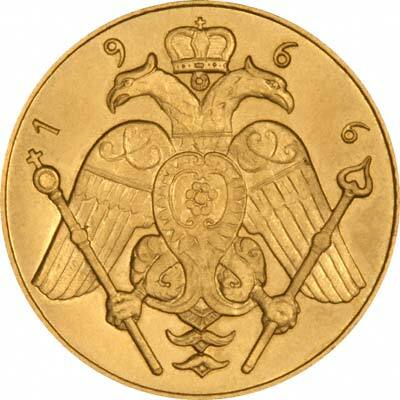 Although the designs at first sight appear identical, the full sovereign has its mintmark below the portrait on the obverse, while the half sovereign has its mintmark on the reverse, below the eagle, in place of a second pair of tail feathers. As noted above, these are regarded as medallic issues. They possibly had no legal tender status at the time of issue. 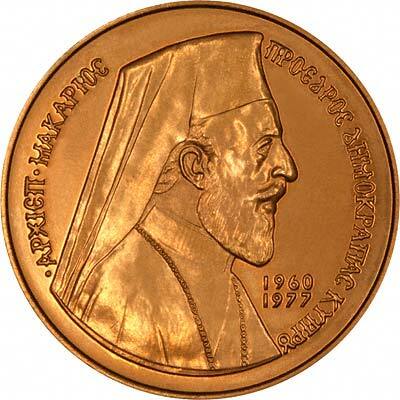 We note that in Krause's Unusual World Coins book, that these are described as "Archbishop Makarios Fund Issues". Krause also describes both coins as proofs, and shows no ordinary non-proof issues, however, the two coins we have shown appear to be non-proof specimens. The British Government retains two British "Sovereign Base Areas" in Cyprus, perhaps the Cyprus gold sovereigns can still be spent there? 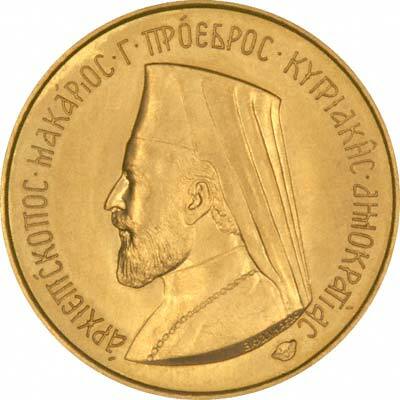 Technical specifications of the most frequently encountered Cypriot gold coins. Other Dates = Either Hejira Date or Compound Date (e.g. 1956 = 1923 + 33). For silver and base metal coins of Cyprus, please look at our original Chard Coins website. 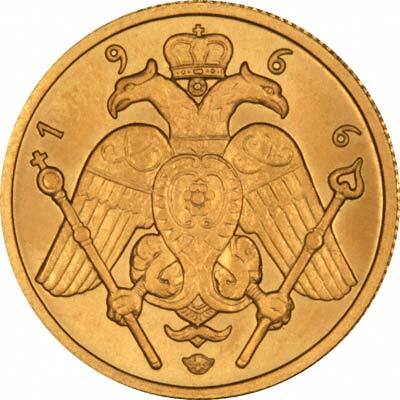 We make an active market in almost all world coins, gold or otherwise, including Cypriot gold coins. If you have any of these coins to sell, please contact us, or post them to us for appraisal and offer.